Nottinghamshire have responded to James Pattinson’s Australia call-up by landing the signature of Indian international batsman Cheteshwar Pujara. Arriving at Trent Bridge in mid-May, the 29-year-old is available to feature in home and away Specsavers County Championship fixtures against Gloucestershire, as well as matches against Glamorgan and Derbyshire. “We have looked around the world to find the right player,” said Nottinghamshire Director of Cricket Mick Newell. “The most important thing was to sign someone with the quality to make us better, rather than limiting our options by saying it had to be a bowler. A fixture at number three in the Indian order since making his Test debut in 2010, Pujara averages 51 in Test cricket with 3,798 runs in 48 matches and 11 centuries. His first-class record, averaging 58 with 30 three-figure tallies, is even more prolific. The right-hander’s seven previous red ball matches in county cricket, for a combination of Derbyshire and Yorkshire, have yielded 483 runs with a mean score of 54. His four Test centuries against England include a career-best 206 not out at Ahmedabad in 2012 and tons in back-to-back matches during the most recent series between the two nations. “I’m ready for it. I’m already working on my skills and preparing for competitive cricket,” added Pujara. 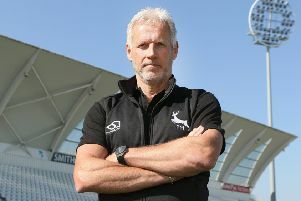 “I love playing county cricket and Trent Bridge is a great venue. I’m really looking forward to my first experience there as a home player.